A Chicago based style blog. I hope everyone had a great weekend! This was a fun one for my family and I! 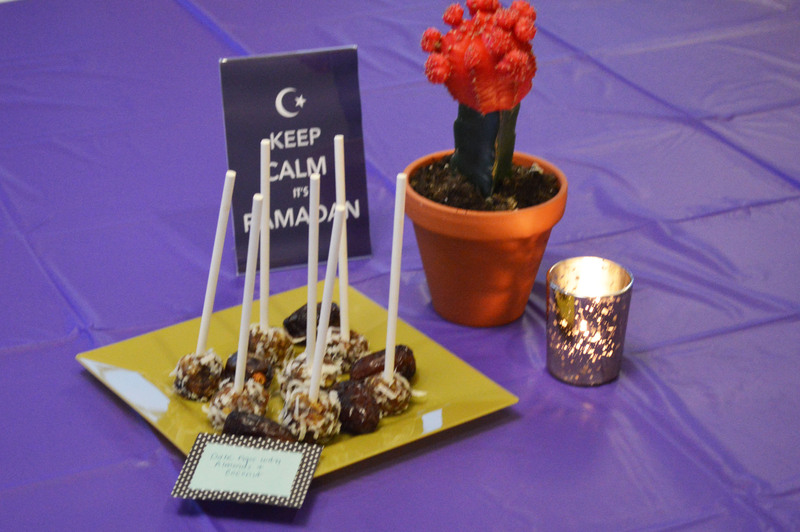 Ramadan is a time of year where you want to be close with family, friends and community! Growing up in Michigan during Ramadan we spent every weekend going to Iftar parties. So when we moved to Chicago 4 years ago I wanted to make sure we kept up with the traditions. On Friday we hosted our Iftar party. It was great to see most of our friends here in Chicago. We of course had Iftar, dinner and dessert, but I wanted to add a few personal touches! I found a great sign off of Etsy from Optical Designs- that said “Keep Calm its Ramadan” . I also made date pops! I found the recipe from this awesome blog based in Dallas, TX called “Honey and Dates”. FInally I added some Ramadan decor around the hall from Ranoon.com. On the Style: The funny thing is, when you start style blogging, you want to go through your closet to see what you have and what you think will look great when you put it together with different outfits. I bought these yellow snake skin design shoes from BCBG generation so long ago. I forgot I had them, so when I found them again – I wanted to plan an outfit around them! I love neutral tones. 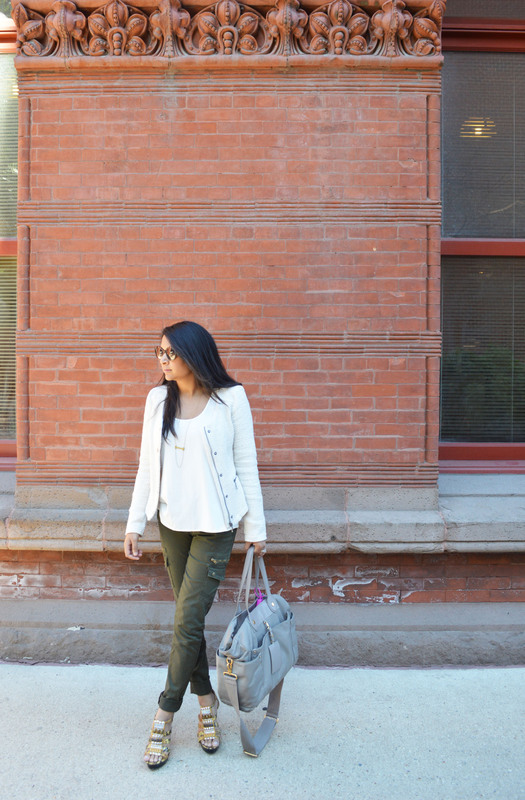 So for this outfit I paired these fabulous cargo pants from Zara with a loose fitting tank and a tweed jacket that I picked up at the Nordstrom Anniversary Sale! 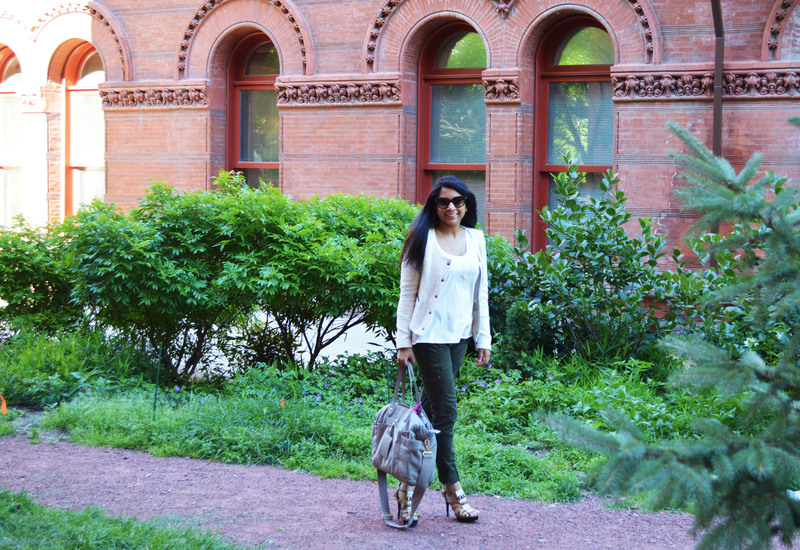 In some of the pictures, I’m carrying Baby Z’s Diaper bag (can’t leave home without it)!